DC’s Legends of Tomorrow reveals the truth about Ava as Zari is tasked with helping Mick learn to control the Fire Totem. The mystery of Ava is a relatively recent thing thanks to a cryptic remark by Rip revealing that there is a truth to be uncovered. This is combined with unnecessary angst associated with Sara breaking up with Ava following the events of last week’s episode so the Sara/Ava relationship is something of a mess at the moment. There’s something really forced about the way the truth about Ava comes out. Gary coming to the Waverider to ask for help finding her is somewhat contrived though having him decide to look for her on the Waverider does make a lot of sense. Showing up looking for her because she has taken some time off work lacks any real urgency and makes the whole thing feel a little trivial. The episode takes the viewer through the mystery that is Ava by first visiting her parents who turn out to be actors pretending to be her parents; no doubt put in place by Rip Hunter in order to sell the lie. 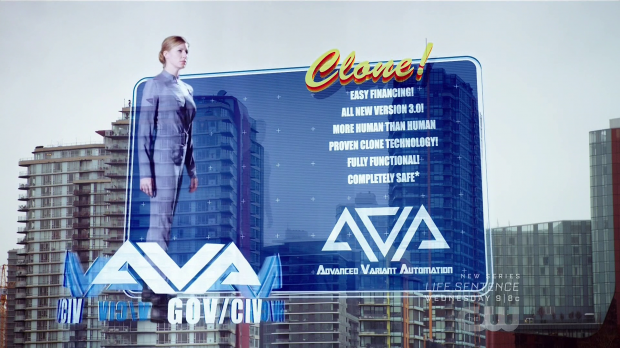 This leads them to Vancouver, 2213 where they find out that Ava actually stands for Advanced Variant Automation and that she’s one of a series of clones designed to serve as the police force of that era. All told this is actually a clever twist worthy of The Twilight Zone as it offers the potential for Ava to question her sense of identity since she quite literally comes off an assembly line. What makes her different to any of the other countless versions of her and what does this knowledge do for her self confidence? Unfortunately this episode isn’t really interested in exploring any of that because the whole thing is treated as something of a joke. More time is spent on Sara, Gary and Ray’s comedic reactions to the situation rather than exploring the deeper implications of it. Ava doesn’t seem to have too much trouble with what she learns either as she decides pretty quickly that she is her own person distinct from the other clones. She does have a moment of self doubt towards the end designed to connect having a troubled past to leadership. It doesn’t quite work as Sara’s self doubt is more to do with knowing exactly who she is and what she’s capable of where Ava has just learned that she doesn’t know herself as well as she thought she did. Part of the problem with this plot is there is no detail to it. We see countless clones of Ava performing various functions in society and we see the factory where they are manufactured but we don’t learn anything about the clones. Are they mindless drones with a specific purpose or do they have their own agency? Are they mentally conditioned to do a certain job or do they have some element of choice? The very existence of “our” Ava proves that they are capable of independent thought, ambition and creating emotional connections so have the authorities of 2213 Vancouver allowed the creation of a slave race that is being horribly mistreated? All of these questions and more are posed by this concept and the episode has no interest in exploring any of them which makes the reveal empty and amounts to little more than an excuse for a fun action sequence. I’ve often said that this show consistently proves that silly doesn’t have to mean stupid but this is definitely one of those occasions where silly is very stupid. The mystery isn’t entirely solved as it is still unclear why Rip recruited Ava and went to the trouble of creating a fiction to help conceal the truth. One thing the episode makes clear is that Ava is desperate for answers so Rip will have some explaining to do when he next appears. I would be more interested in those answers had the episode treated this reveal as something other than disposable. For the rest of the characters this episode could be best described as “busy work”. Each of them are involved in a plot that feels like little more than an excuse to occupy their attention for a while. Not that any of it is especially terrible but there’s a lack of purpose to everything that goes on in this episode even though some major revelations do happen. The most interesting involves Kuasa’s connection to Amaya. Mari -who sadly doesn’t appear- is injured in 2018 because the Totem was never passed down to her since Amaya lost it. Nate and Wally go to keep an eye on her which leads them to Kuasa who is also there to protect her sister. No matter how complicated her feelings are about her family she still cares about her sister and doesn’t want to see any harm come to her; at least not harm that she hasn’t inflicted herself. Kuasa is a really interesting villain because of her connection to Amaya. There’s a lot of complexity there because the major conflict exists between Kuasa caring about her family and her own desires. She resents Amaya because she apparently favoured Mari over her which is something that Amaya can’t really have an opinion on because the events Kuasa is talking about haven’t happened yet so she can’t justify decisions that she hasn’t made. Family and legacy is very important to Kuasa shown by her desire to ensure that the Totem remains within her family. She would rather it go to Mari than Nora Darhk because she believes that the Totem belongs in her family. Tracy Ifeachor makes this desire believable in her performance allowing layers of depth to be piled onto Kuasa as a character. Her decision to work with Nate and Wally to return the totem to Amaya feels organically grounded in who Kuasa is as a character rather than a left field character decision designed to further the plot. Her betrayal of Nate and Wally once she gains possession of the Totem is also perfectly believable as it’s clear that her loyalty to them only exists until she gets what she wants; after that they’re expendable and she doesn’t care what Damien Darhk does to them. It’s cold but easy to understand as she has no familial connection to anyone else on the team except Amaya. This season has done strong work with Kuasa this season to make her complex connection with Amaya feel lived in and believable. Ultimately this allows her sacrificial moment to have weight to it because what she has chosen to fight for is clear and there’s a certain poetry to sacrificing her own life to help make sure that she is born in the first place. Her death feels meaningful especially since it is felt by all of the Totem bearers across time and space though since she was resurrected before it’s possible that this could happen again once the Legends gain control of the Water Totem. Having this come after Amaya tells her that she’s beyond redemption makes this more meaningful as it gives Kuasa the push she needs to prove that she isn’t. Kuasa’s motivation for returning the totem to Amaya is also a lot deeper than a sense of familial ownership. Despite her resentment of the choices her grandmother made she still has a vested interesting in ensuring her own existence and making sure the Totem is able to be passed down is one way to do that. The other angle is that she resents Nate for distracting Amaya from where she is supposed to be and who she is supposed to be with. She confirms that Nate isn’t her grandfather so his relationship with Amaya puts her very existence at risk. This is something she makes clear to Amaya which gets her thinking about the choices she has made and what she has been forcing herself not to think about. She will have to deal with the problem sooner or later as she has seen increasing examples of what her family go on to do which makes the problem more tangible as she knows what will be lost if she continues her relationship with Nate. It would be different if her grandchildren were a theoretical possibility that she doesn’t really know about but she has met one of them and knows a lot about the other so she can’t simply ignore it. The end of the episode sees her travel to the much talked about tragedy that fractures both her family and her tribe in order to prevent it. Her desire to change the timeline for the better makes sense though since we’ve seen this show before it’s clear that she will likely make things worse. Family is also explored through Damien Darhk admitting to Nate that he’s less than pleased with what is happening to his daughter. His deal with Mallus is something that he’s starting to regret because the cost is starting to feel a little too high. Damien’s feelings on the situation are clear though I wish the episode hadn’t played it for laughs as it muddies the message a little too much. There was definitely room for a more nuanced exploration of Damien’s reluctance to keep going down this path though it does set up a possible betrayal of Mallus. I always like the idea that villains aren’t meant to work together because their agendas aren’t compatible. In this case Damien would rather be the one in charge rather than subservient to Mallus -which is exactly how he felt about Thawne- and the fact that Mallus continues to corrupt his daughter doesn’t sit right with him as it’s clear that he’s losing her. 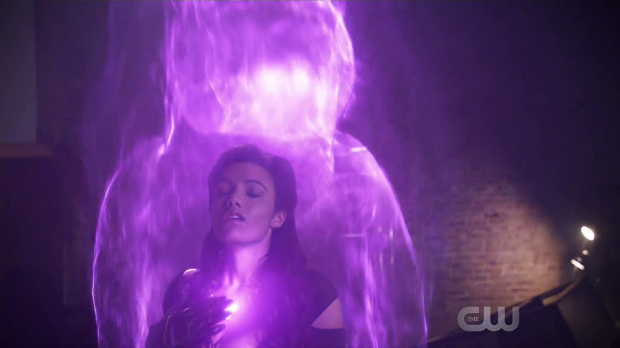 Zari is tasked with training Mick in the use of the Fire Totem. I mentioned last week that making him a Totem bearer creates potential to give Mick more to do than eating, drinking and making mean spirited comments but it doesn’t happen yet. 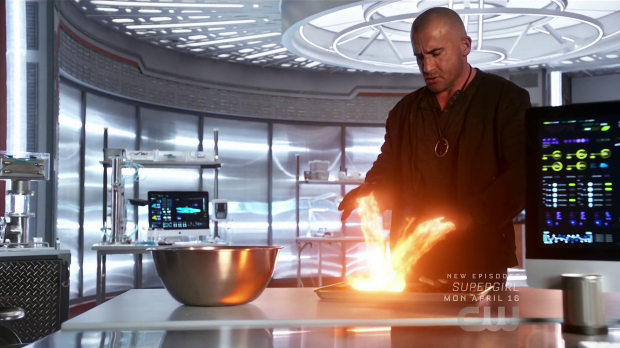 As always Dominic Purcell is really entertaining as Mick uses the Fire Totem to light everything on fire that he can which includes a crude “pull my finger” joke. Zari’s overall lack of patience makes her a less than effective teacher though she does use language that Mick can understand by using her Totem’s power to irritate him in order to mirror how he makes her feel. It’s amusing and gives some insight into Zari’s frustration at Mick’s inability to take the abilities he has seriously. 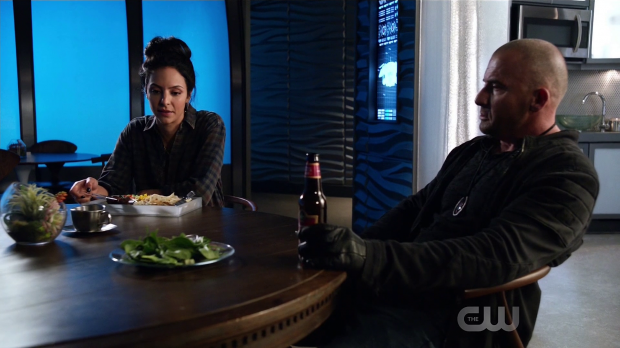 The most interesting thing about this subplot is that Zari is observing Ramadan. Her impatience is somewhat attributed to the fact that she’s fasting. This allows Mick to bluntly ask her why she’s bothering with this which prompts a really illuminating justification on Zari’s part. She observes Ramadan because it reminds her of her family and she sees it as a way of honouring those she has lost. It clearly brings her some form of comfort to do so. Mick doesn’t admit to it but there’s a sense that he understands where she’s coming from and respect that. This also ties neatly into Amaya’s statement about honour elsewhere in the episode showing that religion and culture are important to these characters which allows for alternate perspectives to exist in the same show. It’s nicely handled and delivers fascinating insight into the characters. An underwhelming episode that squanders most of the good ideas that it has. The reveal that Ava is one of a series of clones is potential interesting but the episode turns it into a big joke without considering the wider implications of this. What this means for Ava and the concept of a society using clones as basically a slave race are barely explored so it feels devoid of weight. 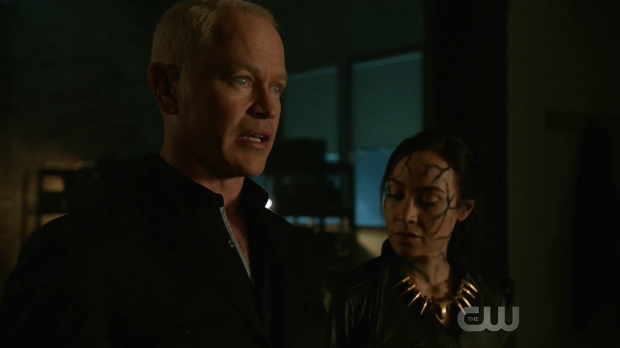 Similarly Damien Darhk’s reaction to Mallus’ corruption of Nora is lacking in weight because once again it’s played as a big joke that prevents this from having the necessary depth. It does set up Damien’s possible betrayal of Mallus and reinforces how much he cares about Nora but it feels disposable thanks to confusing execution. The episode does a really good job with Kuasa by exploring familial loyalty as well as a defined interest in ensuring her own existence. This allows her motivations to be complex and makes her sacrifice meaningful. Having this motivate Amaya to attempt changing the timeline makes for an interesting cliffhanger as well. Unfortunately Mick continues to behave as normal but using this plot to explore Zari’s religion and what that means for her works really well. It offers great insight into the character and is respectfully handled.